Titanic General Arrangement Plans in 1/350th scale. Road? The engine rooms and propeller shafting? What the size of the deck planking was in the well decks? indicated for each deck, this offering is quit literally an overload of information. 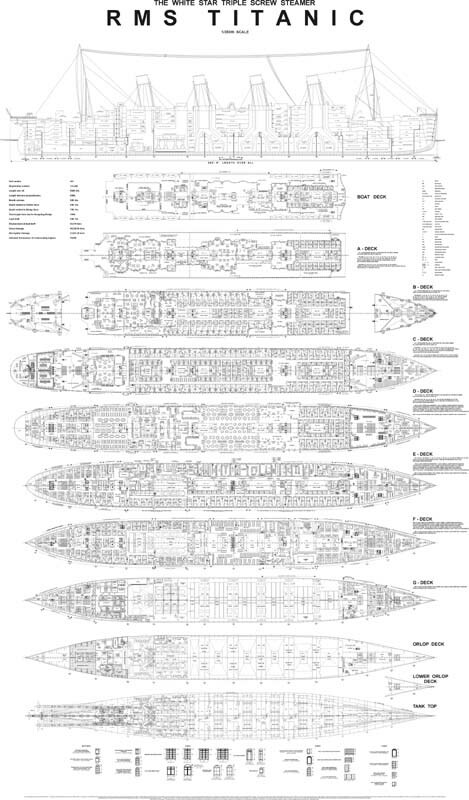 Drawn by Titanic historian Bruce Beveridge with the expert assistance of Scott Andrews and Daniel Klistorner, you will not see anything of this magnitude anywhere else. includes water closets, upholstered sofas and settees, wall seats, wash basins, dressers, wardrobes and more. encompasses the whole ship for all three classes, and crew. The size of the plan is approximately 36” X 54” (914 x 1371 mm) and is suitable for framing. US customers ONLY. Please contact Bruce Beveridge directly, because he will handle your order. Being a trustee for the TRMA, I believe that information such as is available on these plans should be made available to the public. It is because of this philosophy and love for this ship, that I drew these plans, and am offering them here. The references used for this work encompass, among other things, Harland & Wolff’s general arrangement plans of the Titanic (early rendition), original construction drawings and deck iron plans, wreck footage, survivor testimony, period photos, the Titanic’s (latest edition) 1st class passenger plan, and Olympic general arrangement plans not commonly available to the public. Most importantly I used the Titanic’s general arrangement plans issued my Harland & Wolff for the Limitation of Liability hearings. 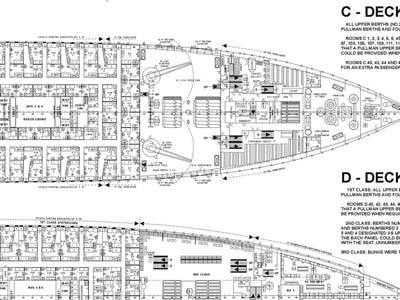 This plan indicates the correct room numbers and room configuration of Titanic as she sailed from Southampton. 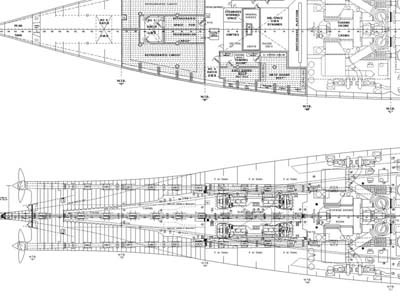 The general arrangement plan printed in many Titanic resources, and was available from Harland & Wolff up until a few years ago, is an early rendition and does not include the later changes made to Titanic’s interiors. No one knows all of the Titanic’s general arrangements. A historian can only rely on available resources, and knowledge of maritime practice of the era, to interpret would may have been. With every bit of information gathered that I could find, and after sifting through rolls and rolls of Olympic plans for what would have been 1912 era fittings, I created what should be an accurate depiction of Titanic’s internals. Those compartments based solely on Olympic are indicated as such, and compartments based on an educated guess (based on Olympic) are also noted. Most people in the Titanic Enthusiast arena know me for my studies of external appearance, fittings, and machinery as this is my center of interest. But because of my limitations on the Titanic’s internal arrangements, I had to find historians who specialized in specific areas of the ship to double-check my work. I was able to recruit Scott Andrews for the Engines and auxiliary machinery, and Daniel Klistorner for furniture and room arrangements. These gentlemen are without doubt the best there is in these fields. Ray Lepien contributed greatly by actually purchasing original documents from the Olympic so I could use them for reference, and Peter-Davies Garner, with the help of Steve Rigby unearthed some rare Olympic plans that I needed for the 2nd class compartments and the lower decks of the ship. I thank them all! Disclaimer: This item is a product of Bruce Beveridge alone.